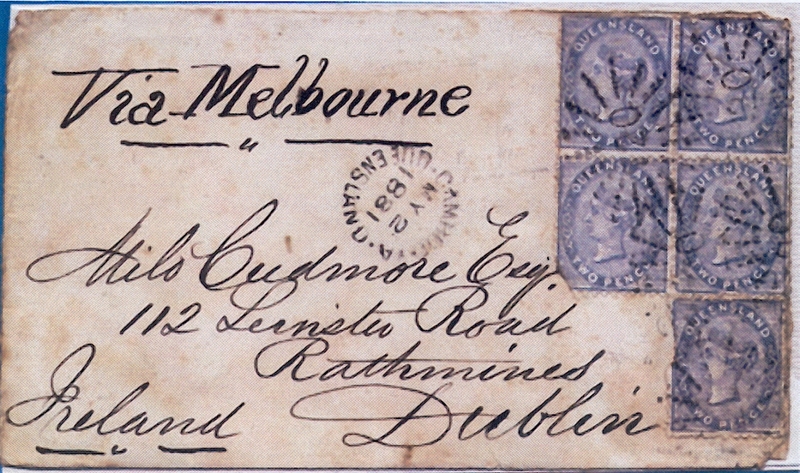 While researching my last post on the Cudmore family in Queensland, I came across an Australian philately blog with a post about a cover that was sent from Queensland via Melbourne to Milo Cudmore Esq, 112 Leinster Road, Rathmines, Dublin, Ireland. The cancellation stamp is CAMBOOYA/ MY 2/ 1881/ QUEENSLAND . The author of the blog post, Maurice, was uncertain of the connection between Milo Cudmore of Dublin, Ireland and the Australian Cudmore family. Milo Clanchy Cudmore (1808-1900) was my fourth great uncle, the brother of Daniel Michael Paul Cudmore (1811-1891). They were the sons of Patrick Cudmore (1778-1827) and his second wife Jane Sarah Cudmore née Russell (1792-1879). Milo and Daniel were born in County Limerick, Ireland. Milo Clanchy Cudmore was evidently named after Milo Clanchy, the husband of his aunt Mary Clanchy née Cudmore. Milo Clanchy died 3 May 1817 and left an inheritance from which Milo Cudmore’s father Patrick benefited, with some residue for Milo and Daniel. Milo and Daniel’s mother Jane was a member of the Religious Society of Friends, a Quaker. Evidently to further their education Milo and Daniel were placed in Quaker homes in England.. Between about 1822 and 1828 Milo was apprenticed to Levitt Edwards, a baker and flour dealer of High Street, Chelmsford, Essex. He boarded with the Edwards family. Daniel was placed with Mary Levitt, a relative of the Edwards family, and her husband William Impey at Earles Colne, a village north-west of Chelmsford.The boys saw each other from time to time while they were in England. In 1830 Milo and Daniel returned home to Limerick in Ireland. In 1835 Daniel Cudmore married Mary Nihill (1811-1893) and emigrated with the Nihill family to Australia. Milo married Rebecca Harrison in 1839. In 1840 a newspaper notice lists Milo as the proprietor of a grocery shop in Sackville Street, Dublin. Milo and Rebecca Cudmore had at least five children, including a son named Milo (1840-1892) and a son named Henry Russell (1842-1919). In 1875 Milo and his brother Henry were listed as applicants for land at Eton Vale near Toowoomba, Queensland. (OPENING OF THE HOMESTEAD AREAS. (1875, October 14). 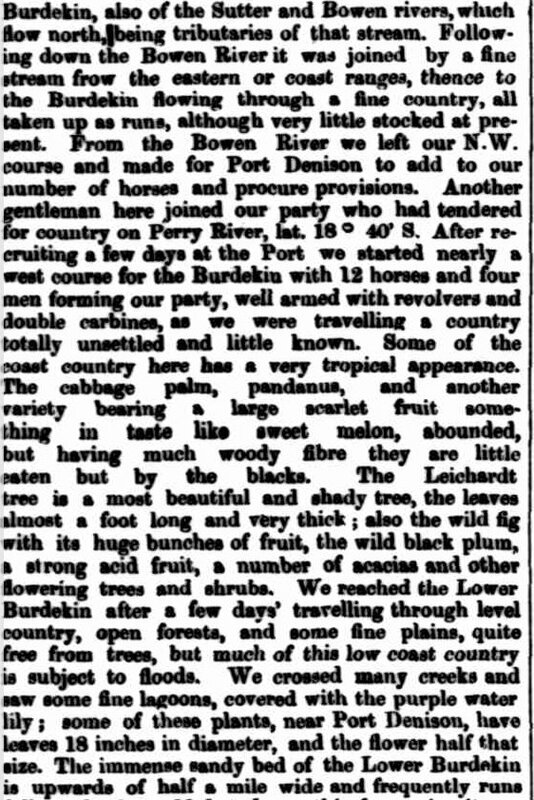 The Darling Downs Gazette and General Advertiser (Toowoomba, Qld. 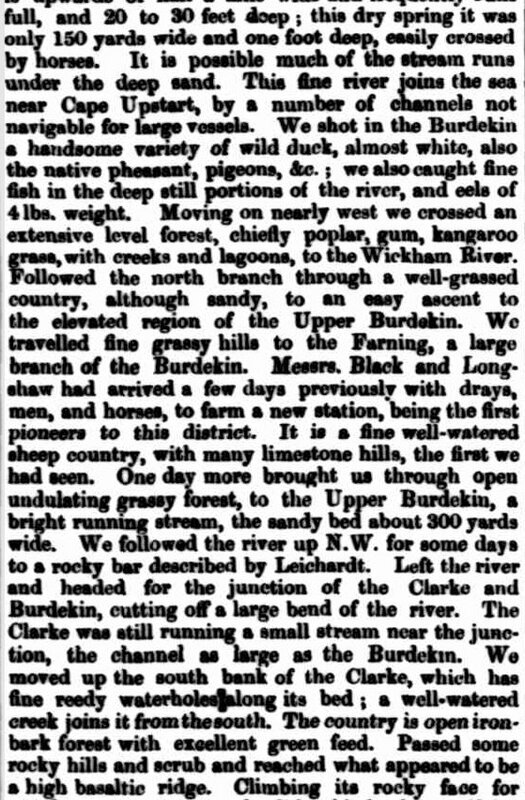 : 1858 – 1880), , p. 3. 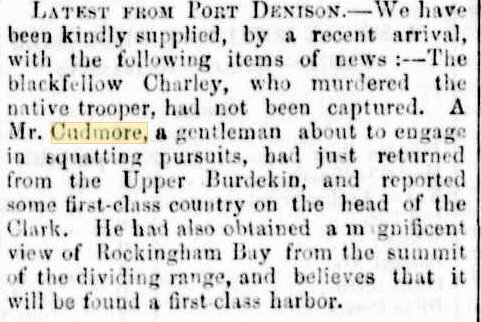 Retrieved from http://nla.gov.au/nla.news-article77765831 ) There is a Milo Cudmore listed in the unclaimed letters of 1865 for Port Denison, Queensland. It may be that the brothers were in Australia earlier than 1875. The brothers were evidently successful in their 1875 land application. 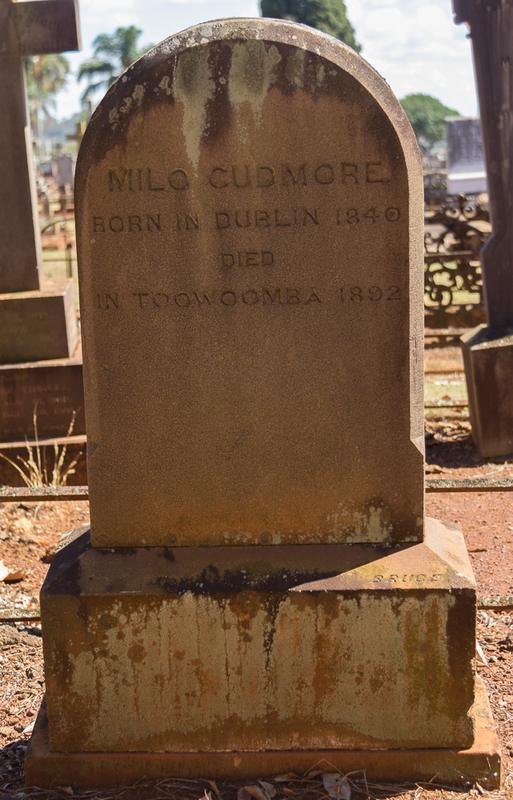 Milo Cudmore is listed on the 1875 electoral rolls as being at Emu Creek which is just north of Toowoomba. In 1892 it was reported that Milo Cudmore of Woodlands, six miles beyond Cambooya, fell from his horse and broke his leg. Cambooya is near Eton Vale, 20 km south-west of Toowoomba on the Darling Downs of Queensland. 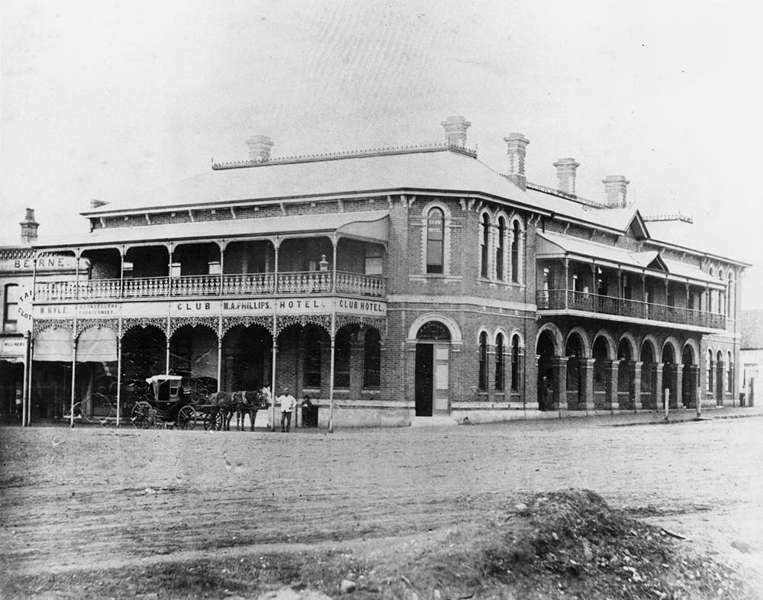 Milo died at the Club Hotel, Toowoomba on 24 February 1892. The Club Hotel Toowoomba. 442 Ruthven street (cnr Margaret street). Originally know as Commercial Hotel and later the Queens Arms Hotel. It is no longer standing. Image from Flickr. Newspaper passenger lists show Henry Russell Cudmore leaving Brisbane on 29 January 1892 on the Buninyong, which sailed for Sydney, Melbourne and Adelaide. Henry returned from his trip to administer his brother’s estate. He left Brisbane again in September. 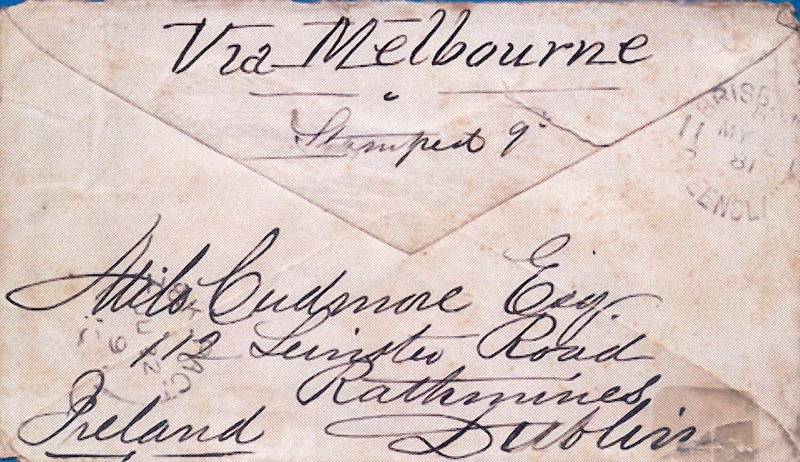 It seems that the letter of 1881 was written either by Milo or Henry to their father in Dublin. It was possibly written by Milo and hence the sender’s name is the same as the addressee. Milo Junior seems to have regarded Dublin as his home address for the purpose of the mail. 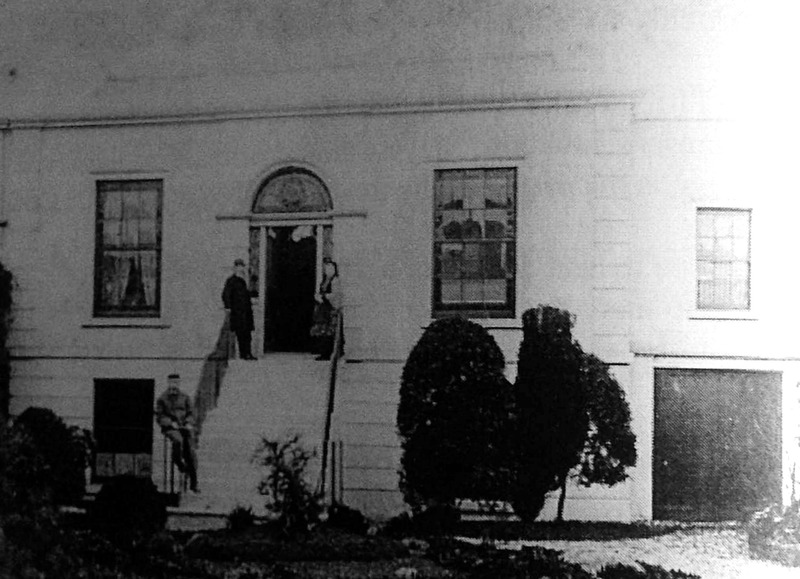 The house at 112 Leinster Road, Rathmines, South Dublin still stands. It is a heritage protected structure (#4712 of Dublin City register). The image from Google street view shows the building is the nineteenth century house. I was surprised to read in the report of Milo’s death that there was only one relative in Australia, a Mr J. Kingsbury. Milo Cudmore had a lot of Cudmore cousins but it would appear they were not in contact. I have not heard of J. Kingsbury before. This is research for another day. It is possible that Kingsbury was John James Kingsbury, a future member of the Queensland Legislative Assembly. J J Kingsbury MLA was was the son of Andrew Kingsbury and Emily née Chadwick. In that case he was not a close cousin, perhaps the newspaper was mistaken about the relationship. Chapter 3 of Ritchie, Elsie B. (Elsie Barbara) For the love of the land : the history of the Cudmore family. E. Ritchie, [Ermington, N.S.W. ], 2000. 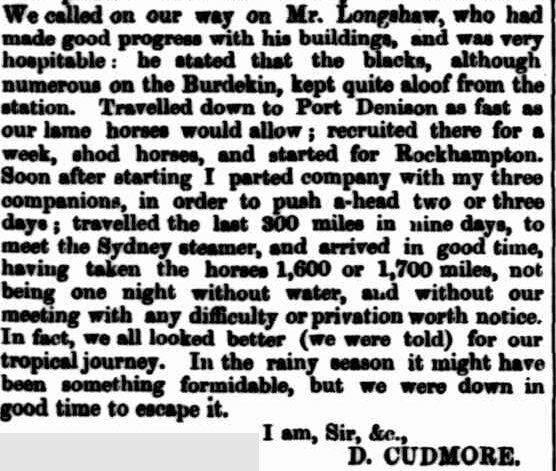 My Cudmore forebears were pastoralists with stations in Queensland, New South Wales, and South Australia. My third great grandfather Daniel Michael Paul Cudmore (1811-1891) arrived in Australia in 1835. In 1847 he inherited property in Ireland but sold it to take up a pastoral lease of 80 sq. miles (207 km²) at Yongala, which carried 18,000 sheep. 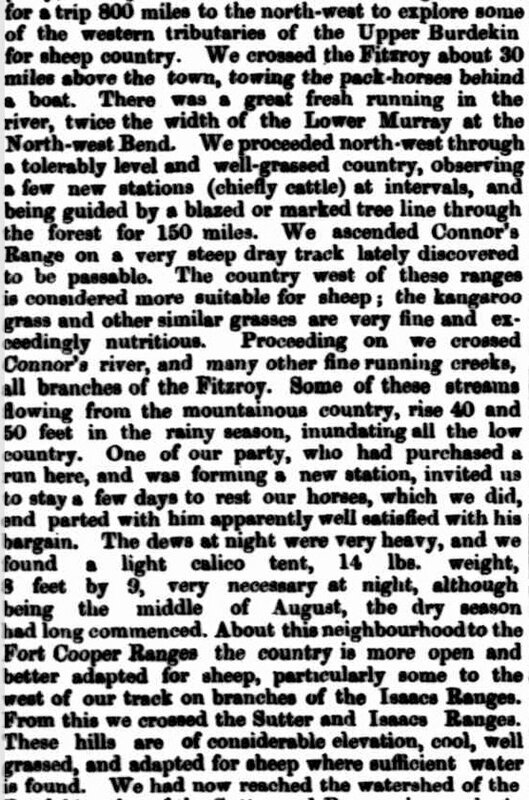 In the 1850s he also leased Pinda, Beautiful Valley and Paringa stations. 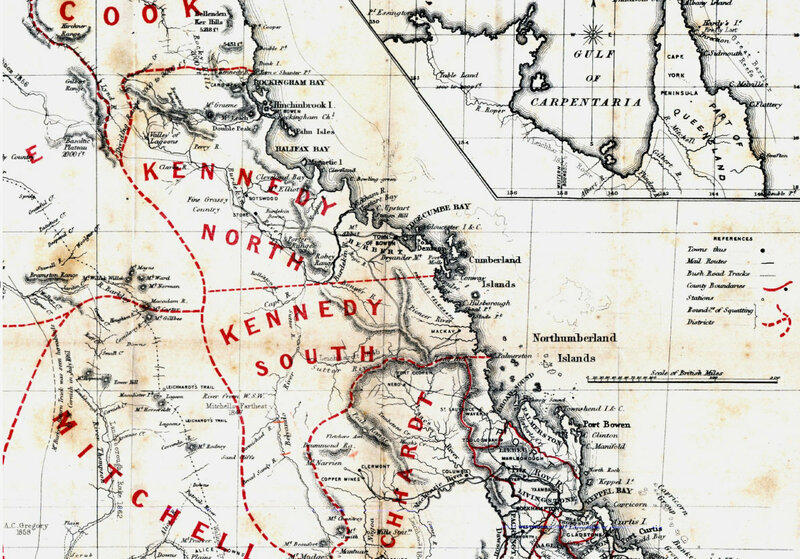 In the 1860s, after a 1700-mile (2736 km) exploratory journey from Rockhampton, he acquired still larger leases in Queensland and New South Wales. 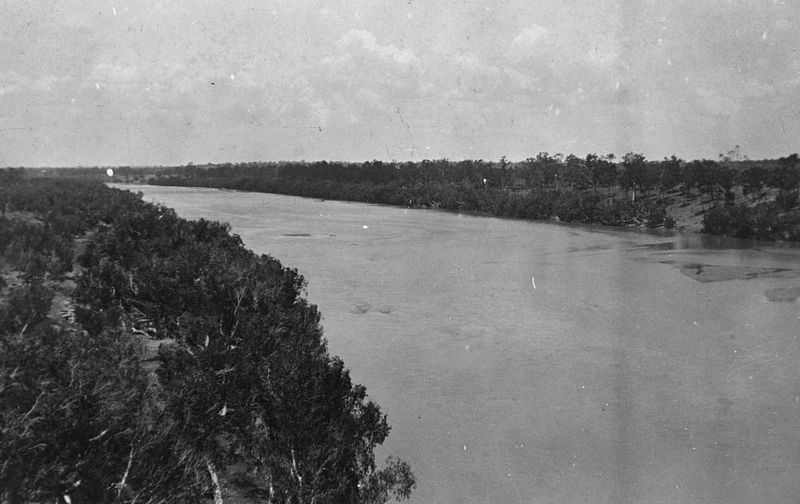 Burdekin River at Sellheim, ca. 1925. Image from the State Library of Queensland and retrieved from Wikimedia Commons. Rockingham Bay was named by James Cook in 1770. It is 150 km south of Cairns. To the immediate south is the town of Cardwell and Hinchinbrook Island. My great great grandfather, James Francis Cudmore (1837-1912), the oldest son of Daniel, took over and extended his father’s pastoral enterprises. From 1859 he managed Paringa, 208 sq. miles (531 km²). 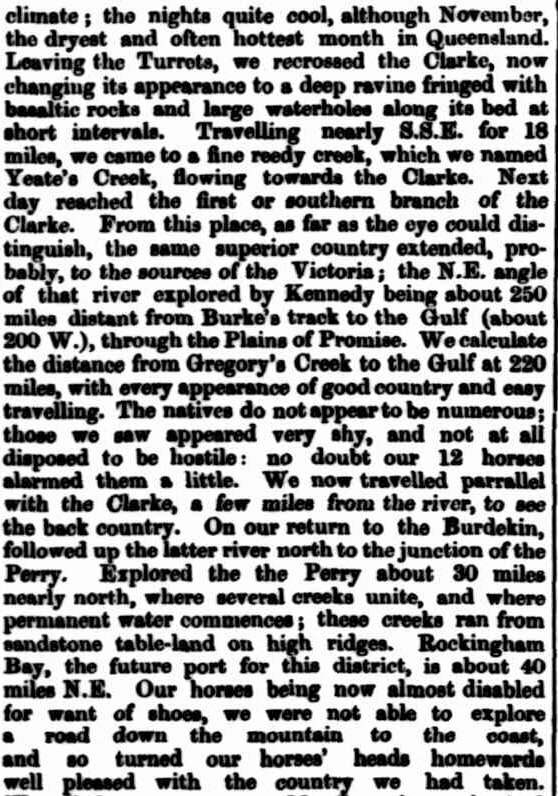 In 1860 he leased Ned’s Corner, further up the Murray. From these properties he overlanded sheep to Queensland and took up leases there. In 1870, in partnership with his wife’s brother Kenneth Budge (1842-1878), he bought Gooyea station on the Bulloo River, Queensland . He expanded Ned’s Corner in partnership with Robert Barr-Smith and A.H. Peglar. 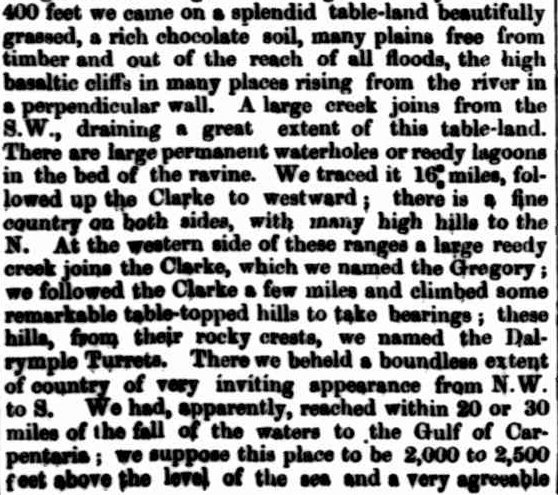 He then acquired Welford Downs on the Barcoo River and combined it with Milo, formerly Gooyea, making a run of 5100 sq. miles (13,209 km²). He took on additional partners Sir Thomas Elder and W. R. Swan, and with them established the Milo and Welford Downs Pastoral Co. . In the 1880s James Francis Cudmore ran into financial difficulties. He moved from cattle to sheep on some properties with substantial costs in changing the yards, fences and equipment required. 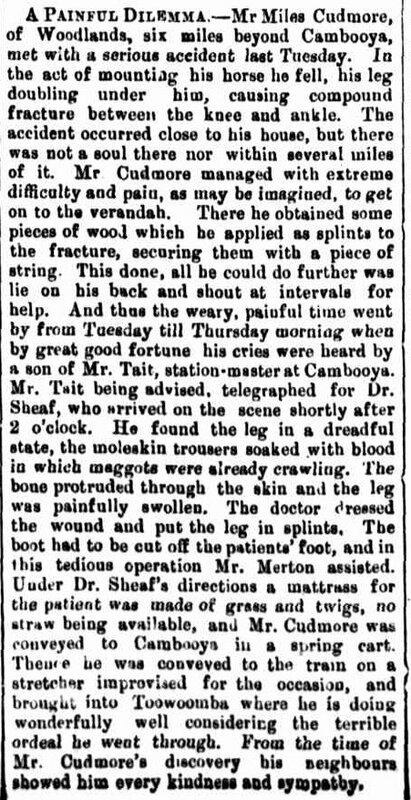 He was also badly affected by the rabbit plague which reduced his wool clip by 80%. 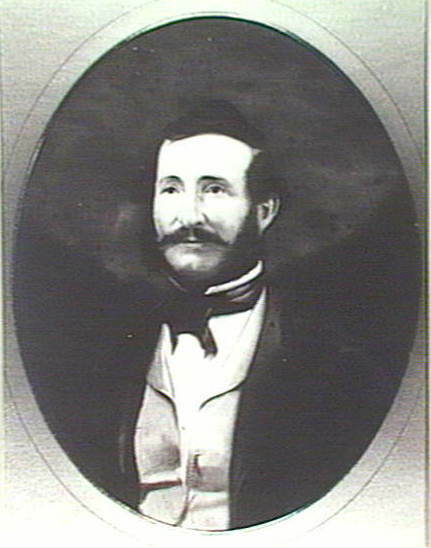 James Francis Cudmore transferred his unencumbered Queensland leases, Tara, Dartmouth and Blackall, to his sons. James Francis Cudmore had six sons. Five of his sons went onto the land. His other son Arthur Murray Cudmore, my great grandfather, became a doctor. Some of my Cudmore cousins are farmers. 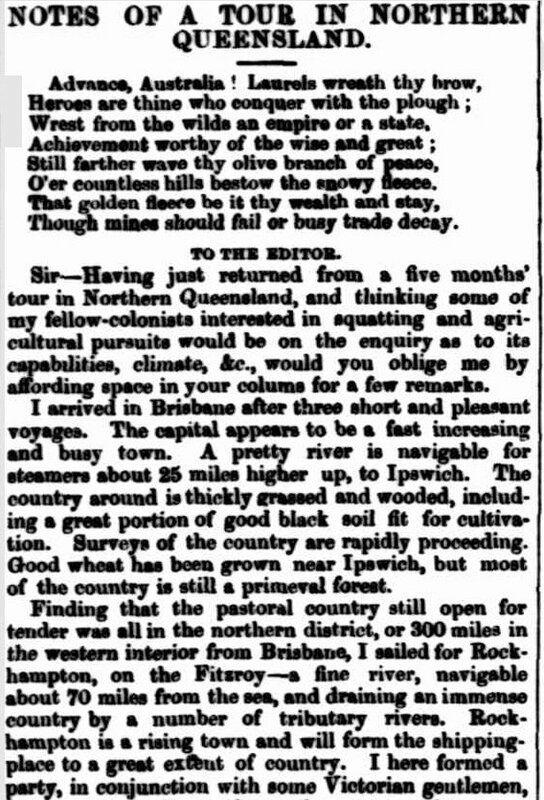 A 1951 article in Queensland Country Life, however, when reporting the sale of a Queensland property by Robert Milo Cudmore (1889-1969), the youngest son of James Francis Cudmore, spoke of the Cudmore family’s leaving the land. An account of the Yeates family settlement of north Queensland by Neil Yeates in 1981. 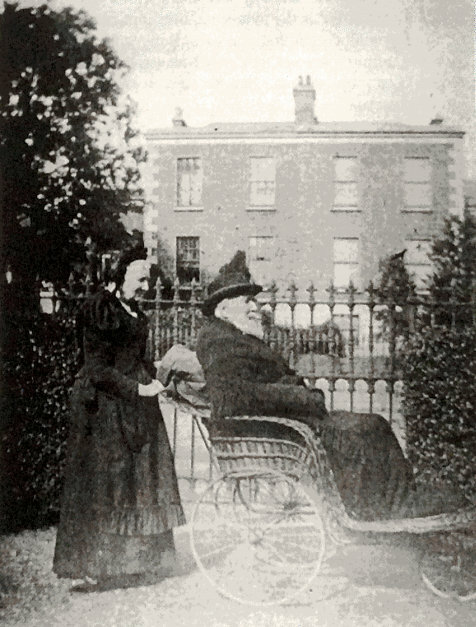 In 1857 Sidney Yeates (1831-1918) married Dymphna Cudmore (1836-1899) Dymphna was the oldest child of Daniel Michael Paul Cudmore. Other Cudmore relatives are involved in this settlement story.